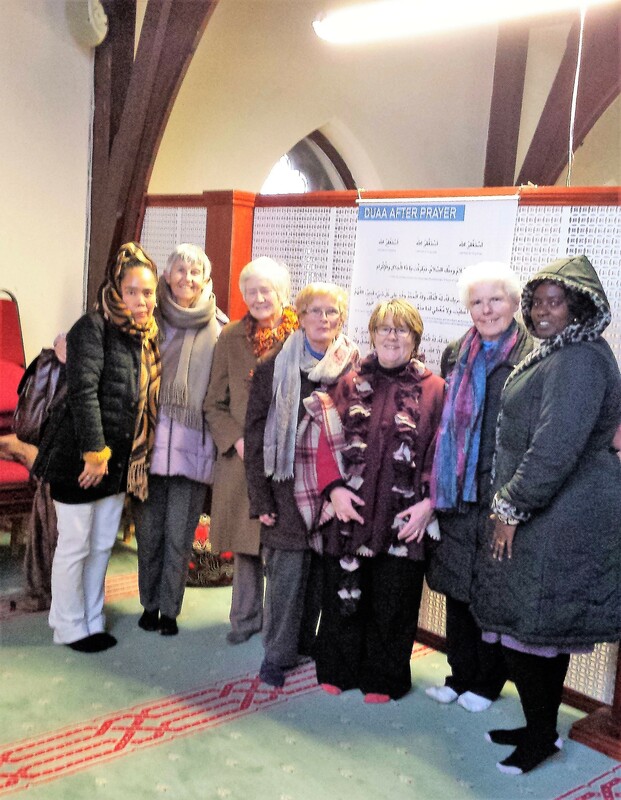 JPIC: Visit to the South Circular Road Mosque, Dublin 8. Some of us LSAs have memories of Irish sisters returning from North Africa back in the 1950’s. They were immersed in Arabic language and culture. They talked about Allah, the name for God, used in the Arab world. We were interested in their mission but had very little realization of how different their lived reality was. Today in Irleand and more so in UK, we meet people from diverse backgrounds and religions, an aspect of globalization that is expanding. We realize that in order to respect and value these differences we need to understand the cultural and religious backgrounds from whence they come. This is particularly relevant in relation to Islam. There are approximately 60, 000 Muslims in Ireland. In 1983 the Muslim community bought the Presbyterian church in South Circular road and converted it into a Mosque. As the name suggests, JPIC is committed to peace-making as part of its mission. Welcoming diversity is a necessary step in building a peaceful world, where all can live together enriched by our differences. With this in mind we paid a visit recently to the Mosque in South Circular road. There we were met by the manager of the Mosque, whose name was Mudafr. On entering we were required to remove our shoes and wear a headscarf.. In a reflective talk given in a room off the foyer, Mudafr introduced us to the essentials of Islam. The essential dogma of Islam is that God (Allah) is the Supreme Being, transcendent, omniscient and Almighty. Belief in the Old Testament prophets: Adam, Noah, Abraham, Ishmael, Isaac, Jacob, Moses. Jesus, son of Mary is regarded as a prophet. Mohammad is considered as the last of the prophets. Belief in the revealed books, especially the Qu’ran (Koran). Belief in the day of judgement when each one will appear before Allah. In addition to the above beliefs, Mudafr outlined what are called the five pillars of Islam. Profession of Faith. “There is no God but God (Allah), and Mohammad is his prophet”. This testimony is the most important pillar of Islam. Prayer. Muslims pray five times a day: at daybreak, noon, mid-afternoon, sunset and at night. These prayers of adoration can be said anywhere. Friday is a special day of prayer when the Imam speaks at Prayer time in the Mosque. Giving to Charity. Believers are expected to give 2.5% of their savings to the Poor. If money is not given directly to the needy, it is kept in a Mosque account and strictly used only for the Poor. Fasting: The month of Ramadam is the ninth (lunar) month of the Islamic calendar. Muslims fast from sunrise to sunset. This is seen as a means of spiritual growth. The Pilgrimage to Mekkah and Medina. Believers who are physically and financially capable, are expected to make this pilgrimage at least once in their lives. After this talk on beliefs and practises, Mudafr brought us through the Mosque. It is very simple with little decoration and no religious images, apart from a phrase written in Arabic calligraphy. The section for women is separate, on a balcony. Some of the customs and indeed some of the language was new to us and challenged us to welcome differences in “the other”. We appreciated the time and input given by Mudafr. Each of us was impressed by his gracious and gentle manner. We had tea with him in the Mosque café, which was relaxed and friendly. We also purchased some items in the shop attached to the café! There will be more information about this later.